Those Irish Walsh sisters are at it again. Over the years, each of the older of the 5 Walsh sisters has had her own novel, written by the enormously talented author Marian Keyes. It was finally time for little sister Helen to have her own book, and boy does she get it in the new novel ﻿The Mystery of Mercy Close: A Walsh Sister Novel. Helen, the most brash, unapologetic and unconventional of the sisters had a somewhat thriving business as a private detective. She had her own apartment (even if the decor and furnishing were alarming to most people), a great friend (her only friend) named Bronagh, and a relationship with the equally oddball Jay Parker. Then it all came crashing down. The Irish economy took a severe hit at the same time that Helen was hit with crippling depression. The novel opens with Helen dealing with the repercussions of all this mess -- her business has dried up, she can no longer afford to pay her mortgage, all her furniture has been repossessed, and even Bronagh and Jay are not in the picture any longer. What else is there to do but move back in with Mammy Walsh? Mr. and Mrs. Walsh aren't too pleased to see the 32-year-old Helen coming back home, but she's family, so it's accepted as part of the bargain. Luckily, things aren't all gloom and doom for Helen. She does have a hunky new boyfriend in the form of policeman Artie, but he comes with baggage: three kids ranging from clingy (Bella) to hostile (Bruno) and a gorgeous ex-wife who seems to spend an awful lot of time at his house. Also, Jay Parker has turned back up offering to hire Helen as a private investigator to find Wayne Diffney, member of the boyband Laddz, before their reunion tour begins in less than a week. Wayne has disappeared, and all Jay's efforts at finding him have come to nothing. Helen is relieved to have a job to do again, mainly because she's begun experiencing the horrible beginnings of another bout with depression. It was quite insightful to read about the symptoms Helen experienced, as well as her efforts to find some sort of treatment that would magically cure her. Since the author herself has written quite a lot about her own battles with depression, most recently in the cookbook Saved by Cake: Over 80 Ways to Bake Yourself Happy I know that she was speaking from experience. Helen's lack of progress in the case, coupled with her less-than-ideal living situation, cause her to spiral downward into more severe depression. Still, she continues on with trying to find Wayne, even when another member of Laddz hires another private detective. Her work on the case is the only thing that's keeping her from suicide, and eventually even that isn't enough of a distraction to keep her mind from wandering in that direction. 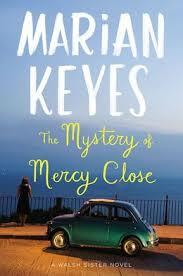 Although this book, like many others by Marian Keyes, has, at its heart, a very sad story, she has such a funny way of writing and and her characters are so charming that the books don't feel terribly sad at all. I hope that we will still have more books about the Walsh sisters and Mammy Walsh to look forward to in the future.